It can be difficult to know what to do with old scrap tires. Most states no longer accept whole tires into landfills, and many have very strict regulations about the amount and condition of the tires they will accept. When possible, you should take your tires to a recycling center so that they can be reused. 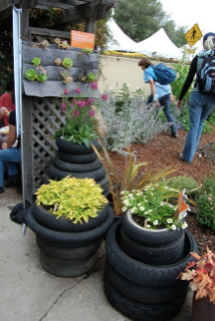 Or, here are some ideas for reusing your scrap tires in your own home and yard. Rubber tires are made of an extremely durable material, which is resistant to punctures or tearing. Rubber also absorbs heat, which makes it a smart, eco-friendly building material. When properly installed, rubber shingles are a great heat and water resistant roofing material. 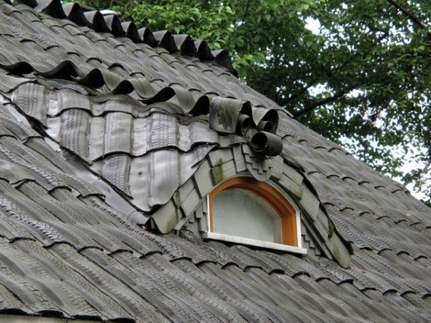 You can purchase commercially produced rubber shingles, or re-shingle your roof with strips created from scrap tires like the daring DIYer above. For the zealous tire recycler or humanitarian, scrap tires make excellent home building materials. 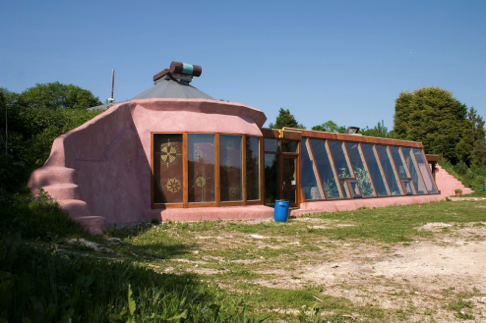 Earthships, or self-sustained, green buildings and homes, like the one pictured above. Many of these eco-friendly buildings utilize tires in the foundation and walls. Some, like this one, are model homes only, but earthships are also being built around the world in impoverished or disaster-stricken nations. You can support this effort by donating your tires to the cause, raising awareness, or building an eco-friendly home or children’s playhouse of your own. Depending on the needs of your yard and garden, you may have a lot of options for using tires to beautify your home. Below are just a few suggestions. Hanging planters, or pots like those pictured above, are a popular home-recycling choice. These planters are waterproof. Great for weather-sensitive plants, these planters absorb heat and sunlight, and add a bit of funk and whimsy to your garden. 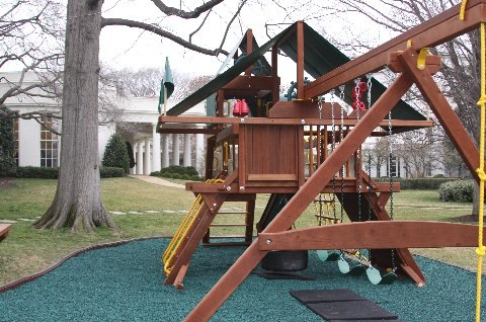 If you have children at home, you know how dangerous the simplest play equipment can become. Rubber mulch, or ground cover, is a great option for protecting your kids from everyday slips and falls on your home swings or playground. Many public playgrounds are adopting this environmentally friendly ground cover option (do you recognize the house in this picture?). Tire swings have been around for decades, and there’s a reason for that. 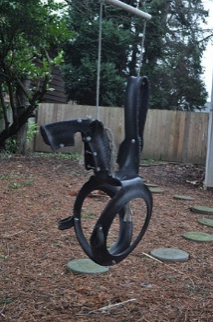 As long as the swing is properly rigged, a tire swing can last an entire childhood, or longer. The traditional tire swing will never be out of place in America’s backyards, but don’t hesitate to modify the tire, and try out more creative styles like the one pictured above. The durability and versatility of tire rubber makes it a great choice for household items that will receive a lot of wear, such as furniture and flooring. 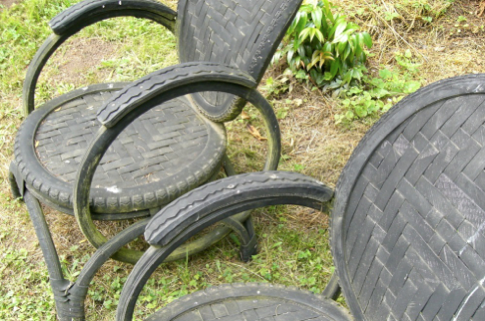 Deck or patio furniture pieces created from scrap tires is a sturdy, environmentally friendly option for your outdoor needs. Much of this furniture utilizes the unique wheel shapes (like the bike tire rims used in the chair arms above) and tread patterning of the tires in its design. If you love the look of tire furniture, indoor options are also available. Done right, these furnishings are as chic and modern as they are green. 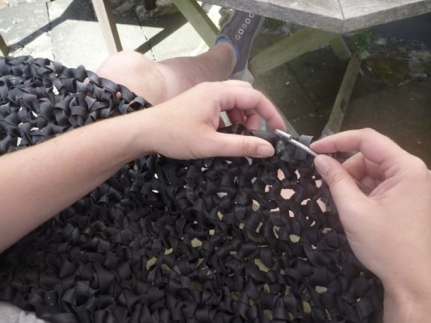 Recycled tire rubber is used to create mats and rugs. You can contribute to recycling efforts by going out of your way to purchase these green flooring options, having a craftsman make your old tires into rubber tiles or woven rugs, or by integrating this sturdy material into flooring projects of your own design! These are only a few of the options available to you. Don’t hesitate to think outside of the box to find ways to make your scrap tires improve and beautify your home!